The American Red Cross is dedicated to training people to respond to, and prepare for, emergencies. In order to empower people, we offer world-class CPR training in Austin and throughout the state. Taught by experienced professionals, Red Cross classes are developed under the guidance of, and reviewed by, the Red Cross Scientific Advisory Council. Course materials are reviewed on a regular basis to ensure that the latest techniques and information are included in every course we teach. Whether your CPR certification is critical for your job or it's just for you, it's important to know that your credentials will expire two years from their award date. However, at the Red Cross in Austin, CPR certification is easy to maintain. We offer dozens of abbreviated recertification classes throughout the year so you can maintain your credentials and skills. 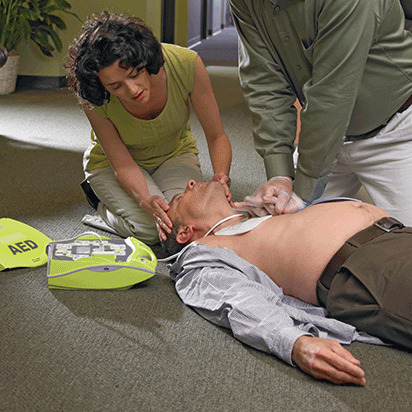 Get the CPR certification you need to meet OSHA workplace requirements. At the Red Cross, our Austin CPR training classes can help you develop life-saving skills that you can use at work, at home and everywhere in between. Choose from our in-person training, or our blended Simulation Learning experience, which combines online coursework, which you can take at your own pace, with an in-person skills session. Both types of classes give you the opportunity to receive full certification that's valid for two years. Our Austin CPR classes and courses are taught by the experts in an intimate setting. This helps ensure that you'll have time to ask questions and become comfortable with the materials before completing your certification exam. Courses take just a few short hours, but can mean all the difference to those in need. At the Red Cross, we know that if you don't use the skills you learn in our Austin CPR training and classes, you're likely lose them or forget key points. That's why we've created step-by-step guides that you can print up and keep with you, no matter where you are. Our one-page instructions offer quick reminders on how to perform life-saving measures, which makes it easy to refresh your memory and maintain your skills. The Red Cross not only offers CPR training in Austin for private individuals, first responders and organizations, but we also offer a special training program for schools, which includes their staff and their students. Find out how to take part in our program, and empower your educators and pupils with the tools to help those in need. In order to ensure that you receive the most accurate, up-to-date information and training available, all of our courses and materials are developed under the guidance of, and reviewed by, the Red Cross Scientific Advisory Council. This 50+member panel of nationally-recognized medical, scientific, and academic experts is dedicated to ensuring that the Red Cross delivers information that is backed by the best science and best practices in the industry. And whether you're taking a CPR class in Austin, or an online course from the comfort of your home, you can rest assured that you're getting accurate, proven training that can help you respond appropriately.